Local minister Brian Wonn read a correspondence approved at the Jan. 10 meeting of the Champaign County Ministerial Association at the Urbana City Council meeting on Tuesday. City council members listen to local minister Brian Wonn read a correspondence from the Ministerial Association opposing the proposed tax increase. The Urbana City Council on Tuesday unanimously voted to place a tax hike on the May 7 ballot. The council authorized an additional six-tenths of one percent tax on income to the current additional four-tenths rate, establishing a new additional tax rate at one percent. The council also unanimously approved a resolution declaring the necessity of an election on this issue to take place May 7. If passed by voters, the tax will take effect on July 1. According to the ordinance, safety services no longer can be adequately funded by the four-tenths rate due to reductions made at the state level of government. Council member Dwight Paul, who is sponsoring this ordinance, said that currently more than 58 percent of the general fund goes toward fire/police/EMS. Bean also said that the city had lost $2.5 million as a result of policies put in place by former Gov. John Kasich, and that Urbana and other cities in Ohio are now seeking ways to make up the revenue. Urbana voters rejected similar ballot measures during the last November and May elections. Several council members said they supported putting the issue on the ballot one more time because support increase substantially as a result of better education on the second try. Local minister Brian Wonn read council a correspondence approved at the Champaign County Ministerial Association meeting on Jan. 10. Wonn said that the challenge of trying to cover increasing costs with limited resources was experienced by all government entities, businesses, organizations and individuals to varying degrees, and that overall the Ministerial Association was thankful for the good work done in managing funds entrusted to the care of the city. The correspondence suggested pausing from consideration of the proposed tax increase to allow time for further study of the relevant issues in cooperation with other community partners. In his remarks, council member Pat Thackery said he kept hearing that there were other options, but that nobody had been able to tell him what those options were. Urbana resident Steve Brune also stood up during the citizens’ comments phase of the meeting to give more details about his suggestion, proposed at the public hearing, that Urbana look to increasing the tax base rather than the rate. He advised that many cities throughout the country were in a similar situation to Urbana, in that they didn’t have room to expand their city limits, but many cities were incentivizing property owners to build accessory dwelling units on their property or offering workforce housing incentives for commercial developments. Council unanimously approved a resolution in support of the Enterprise Zone Agreement and real property tax exemption for Urbana Hotel LLC. Champaign Economic Partnership director Marcia Bailey said that the city school district had already approved the resolution, and that following council approval is must also be approved by the county commissioners before being sent to the state. This concerns property that has been zoned B-2 to accommodate plans for a 54-room hotel on South High Street. Bailey said that a group of nine local investors are continuing to work on final purchase and transfer of the property using a local bank, but that only a rough draft of plans for the hotel is currently available. – Council unanimously approved a resolution authorizing the director of administration to sign a grant agreement with the Ohio Department of Natural Resources for the Natureworks program for park improvements at Melvin Miller Park. – Council unanimously approved a resolution authorizing the director of administration to apply to the Ohio Department of Transportation under the transportation alternatives program for improvements to South High Street. The city held a public meeting about potential improvements on Jan. 10 and is still accepting comments until next Tuesday. There is not yet any cost estimate for these improvements. – Council unanimously appointed the following city residents to the Urbana Charter Review Board: Kimberly Brooks, Charles Moody, Earl Evans, Justin T. Weller, Audra Bean, Cassie Kress, Carrie Thomas, Stephanie Truelove, Amy Paul, Lydia Hess, Patrick Trenor, Addie King, Brandon Shockey, Michelle Heflin, Craig Evans and Al Evans. 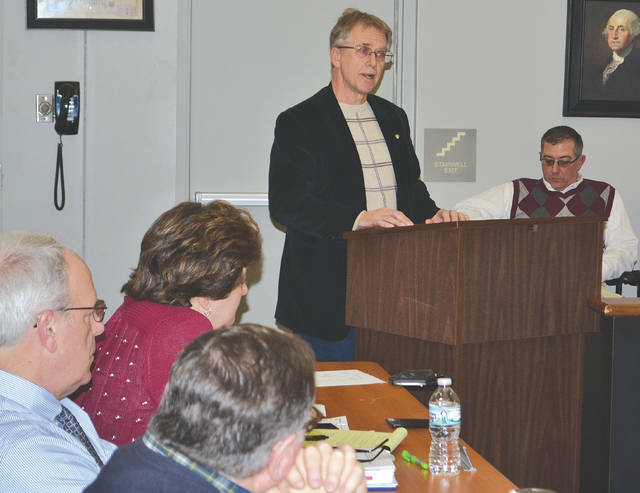 – Council heard the first reading of an ordinance amending ambulance service rates and charges. Paul said that in reviewing the ordinance he discovered that basic life support is increasing by one percent, advanced life support one by 2 percent, and advanced life support 2 by 2.5 percent. Ambulance service rates have not increased since July 2015.